Thoroughly wash the spinach with cold water and remove the stems. Put the spinach in a large pot, cover, and cook on high for about 5 minutes, stirring occasionally until steamed, being careful not to overcook (the leaves shouldn't lose their rich, green color). Drain and dry carefully with paper towels. Set aside. Fill a large pot with water, olive oil and salt, and bring the water to a boil. Add the fettuccine, reduce heat to medium, and cook for 10 minutes, or according to package instructions, so they're cooked al dente. While the pasta is cooking, add the garlic to a medium-sized frying pan with 2 tablespoons of olive oil over medium heat to brown. Add the anchovies and cook for 2 minutes. Add the spinach and stir well. Remove from heat. Drain the pasta, return to the pot and add the other tablespoon of olive oil. 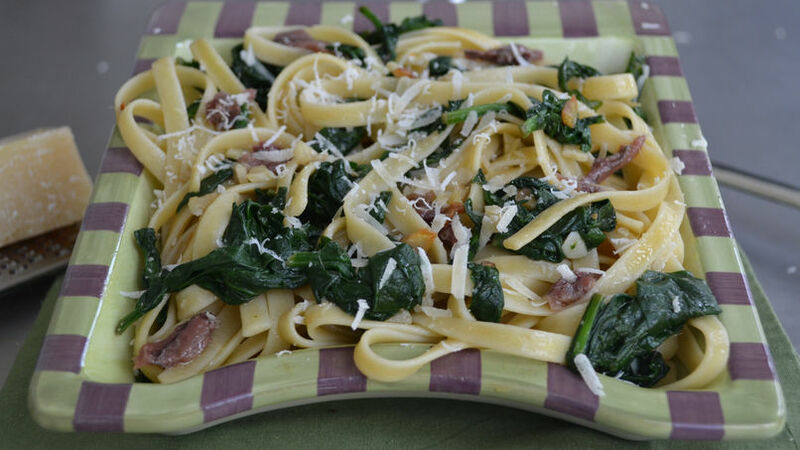 Toss in the spinach sauce and anchovies, stirring to incorporate all ingredients. Serve hot, and sprinkle the top with flakes of parmesan cheese. Buy good quality pasta so it doesn't stick together during the cooking process. Add the pasta to the water as soon as it breaks out in a boil and start the timer right away. Never wash the pasta with cold water while draining to preserve the nutritional value of the noodles and avoid rinsing out the starch. Knowing how to balance a budget is a priceless skill. As the lady of the house, a mother and a professional, I feel responsible for helping manage our money so we can live better, more comfortably, paying what needs to be paid, bringing food to the table, and enjoying free time together as a family. Planning a reasonable weekly menu is relatively easy when you know how to pick the dishes you'd like to prepare ahead of time for your family. Having a weekly menu will help you stay organized as you make a list for the grocery store and stick to it so you know exactly what you're getting without blowing your budget. Focus on simple, budget-friendly recipes that call for few ingredients and that please the whole crowd. For example, plan a pasta-based menu. Most kids and adults love pasta, no matter the dish. It’s a super versatile, economical ingredient. Be inspired by this budget-friendly recipe; you're going to love it! Your kids might not like the thought of eating anchovies: just make it anyway and you'll see that, without even mentioning this wholesome ingredient, they'll be licking their fingers with delight with this delicious meal.